The Great Northwest's Info Source on America's Only Unsolved Skyjacking. Presented by Robert Blevins and the Staff of Adventure Books of Seattle. EDIT: March 15 – All campers have been informed. Due to the fact that the snow level has been pretty low lately, we had to move the location of the campout to a different spot in the Olympics. No big deal, though. We’re up this morning early and packing the truck as you read this. Everyone coming has their new maps, etc. See you there, or be square! AB of Seattle is organizing another public-invited campout to the Olympic Peninsula of Washington state. This time it’s an early spring campout, but not to worry. We never go above the snow line and even passenger cars can make it to our chosen location easily. Date/Time: Friday, March 15, 2019 – Monday, March 18. Camp will be set up by 2PM on Friday. AB staff break camp on Monday morning. You are free to stay longer if you wish. Location: Olympic National Forest, just off Forest Service Road 23, about 20 miles WEST of the George Adams Fish Hatchery. (For safety reasons, we do NOT release the exact location of the campsite publicly. Confirmed campers receive maps and other instructions via email.) See map picture for approximate location. 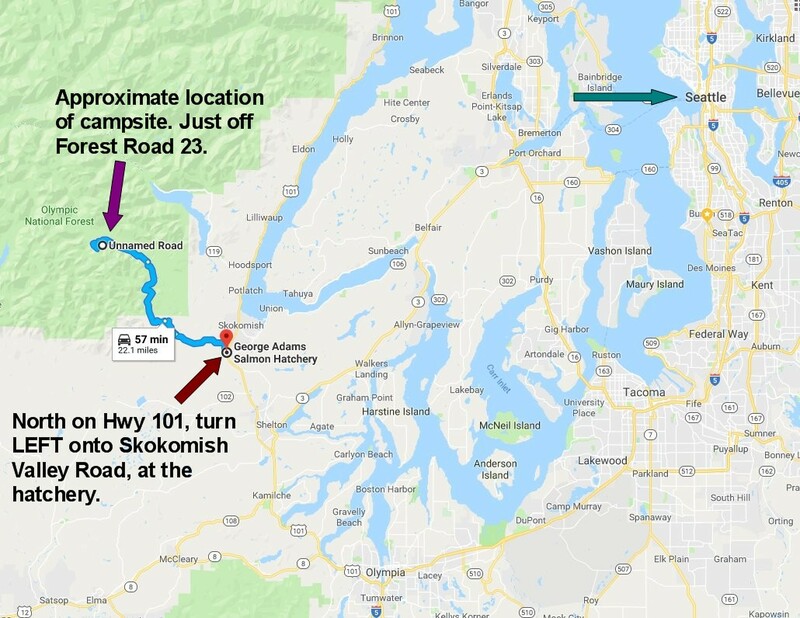 GENERAL DIRECTIONS: From Highway 101, turn left at the hatchery onto Skokomish Valley Road. Follow the road to the end, where it splits in two. One road goes UP, the other stays flat. Take a right and go UP. Road turns into Forest Service Road 23, which is paved here and there along the way. Turn onto 23. Campsite is located on a side road several miles further. Detailed directions and a comprehensive map are provided in to anyone who signs up to go. You MUST CONTACT US FIRST to be allowed to attend. There is a limit of 14 people, due to Forest Service rules on group camps, leaving only 12 available slots since two members of the Adventure Books staff will be there. Just in case you do decide to go, we monitor CB channel 14 and give you our cell number to help keep you from getting lost, and to assist you in reaching the campsite. Cell service at this location has been tested extensively and there is good signal there. Activities: We provide seven basic things for these campouts. A community shelter built from very large tarps to keep out the weather. This shelter also has rudimentary walls to help keep out the wind and cold at night. A smaller shelter with basic supplies and a portable, flushable toilet. There is also a table and a portable shower you can use, but you must heat your own water for it. A Weber propane BBQ that anyone can use. Entertainment in the form of a portable stereo that takes CD’s, memory cards, or USB flash drive. A 120-inch projector screen and an LED projector. This unit will accept USB flash, but does better with DVD’s or VCR’s. You can also hook up your video game system to it if you wish. Feel free to bring your own entertainment, or any movies/recorded TV shows you want to watch. We power our low-draw devices with deep cycle batteries and an inverter, and everything else with a small generator that is placed about 200 feet from the main campsite to keep out the noise. At that distance, you can’t even hear it running. There are also charging stations for your phone, laptop, or other devices. A professional First-Aid kit and some additional supplies, such as Tums, Zantac, bug repellent, and the like. All campers must bring their own shelter, bedding, food, any beverages they wish, (alcohol is allowed) and a CHAIR for everyone in their party. We do not provide chairs! Because alcohol is allowed, absolutely NO ONE under the age of 21 can attend these campouts. If we have any doubt about your age, we will ask for ID, and if you are not 21 you will be asked to leave. Camaraderie, BBQ, day hikes, wood gathering, video games, or just relaxing in the fresh air are usual daytime activities. At night, we show movies or TV series stuff on DVD, or whatever people vote to watch. It’s a very relaxed atmosphere and mostly people just do what they wish. Internet access via cell signal is no problem. We always research sites first before choosing them for an AB campout, to make sure signal is strong where we go. Not only do some people want to phone home, but in case of emergencies we like being able to reach civilization with our smart phones. We picked up an LED projector and a 120-inch outdoor screen to compliment the 32″ smart TV we always take. Bring your fave movies or TV shows on DVD. Exclusively for campers: We will show the two-minute promotional video on the first full-length feature film on the Cooper case. It is the promo for Into The Blast, the story of Cooper suspect Kenny Christiansen. New movies: The Pursuit of DB Cooper with Treat Williams and Robert Duvall, the Tom Hanks’ series From the Earth to the Moon, and many other new films. Campers pick the movies they want to watch, not AB of Seattle staff. For those who don’t want to watch movies, you can hook up your video game system to the OTHER television if you wish. Alcohol consumption is allowed, but if you get weird on AB staff or other campers you will be asked to leave. No one under the age of 21 is allowed. No exceptions. Motorhomes or travel trailers are NOT allowed. Truck campers or vans are no problem. At past campouts, most folks brought truck campers, a tent, or simply slept in their vehicles. One free BBQ meal is provided by AB staff, either on Saturday or Sunday. Other than that, you are on your own for food. Detailed maps and a recommended supply list are emailed in PDF format to anyone who has confirmed to our satisfaction they are DEFINITELY attending the campout. This PDF also contains our cell phone number on the rare chance you get lost. The MAIN rule is to have fun, of course. Some good news concerning the weather on the Olympic Peninsula: Weather Underground is calling for low 60s next weekend in the area selected for the campout. Finally…some heat. We had to reschedule twice now due to the cold weather. Looks like spring is finally breaking through after all! It’s practically a heat wave compared to the last two months. I’m looking forward to dropping in on this campout. Sounds fun! Fantastic Robert!!! Have a great time out there and enjoy the music. It has all the clues about DB. Finally! Spring Breaks Out for Cooper Campout.